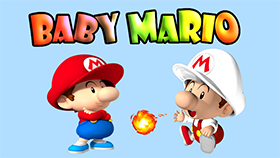 In this game you will control Mario and Turtle. Both have their own skills. Mario can pick up objects and throw them while the Turtle can roll and enter narrow paths. Your task in this game is to help Mario and Turtle overcome the obstacles on the way and go to EXITDOOR safely. However, the challenges in this game are not easy. You have to coordinate Mario and Turtle well to be able to overcome them. You will have 5 lives in this game. Each time Mario or Turtle dies (falls into the water, falls into the hole), you lose 1 life. Mario: A/D to Move – W to Jump/Climb – S to Pick Up/Down Box - S + A/D: Throw. Turtle: Arrow keys to Move - Up arrow key to Jump/Climb - Down arrow key + Arrow keys to rolling attack.